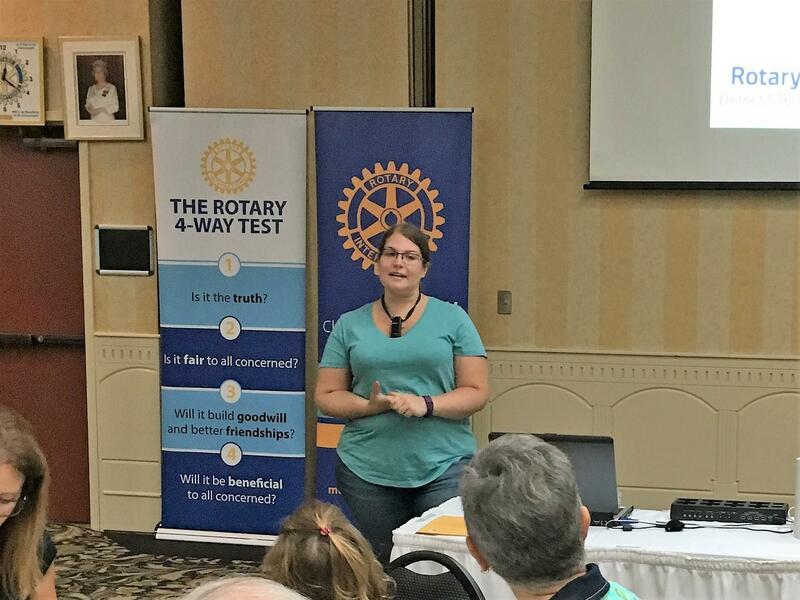 The Rotary Club welcomed Kristen Price, one of the Adult Leaders of the RYPEN camp held every fall under the sponsorship of Rotary. Kristen has been involved in RYPEN for 15 years, as a participant, youth leader and now as an adult volunteer. RYPEN (which stands for Rotary Youth Program of Enrichment) takes place at the South Alberta Bible Camp (SABC) near Lomond on Sept 20 - 23. RYPEN focuses on students who wouldn't normally get an opportunity for this type of training, those students who are marginal or "on the edge"
It builds character and teamwork through a holistic - whole person approach and uses a lot of team based positive reinforcement. Kristen spoke specifically about the "letting go" ceremony, and how it helps kids move forward by dealing with a past issue in a positive way. Please encourage school counselors and teachers, to enroll kids during the back to school period, it can certainly change lives.